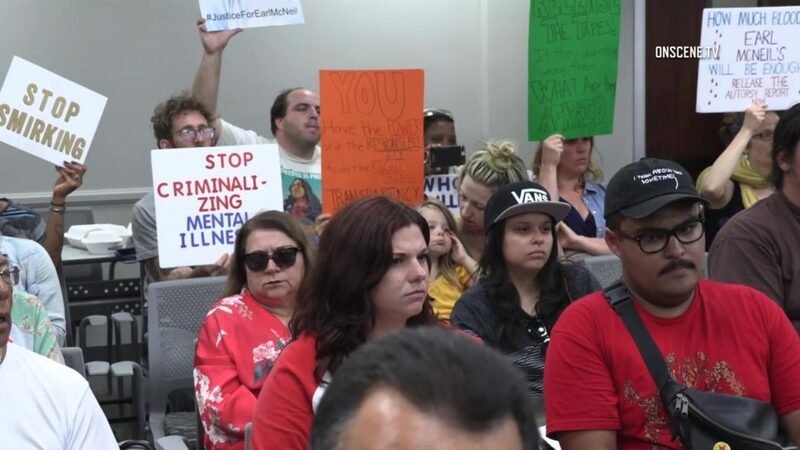 At a National City Council meeting Wednesday evening, a community activist threatened to hold huge rallies in National City if the city does not release video footage of the day a mentally ill man died in police custody. Wednesday’s meeting was a continuation of Tuesday night’s meeting, which could not continue because of several loud disruptions leading to the arrest of three people. Angry community members are pressing to the city to be more transparent and forthcoming about Earl McNeil’s death. Unlike Tuesday’s meeting, Wednesday’s meeting was at first a bit more orderly save for a few disruptions here and there. The tensest moments, however, were during the public comment portion. Williams was referring to the protests in Chicago over the shooting death of Harith Augustus at the hands of police on Saturday. The Chicago Police Department released the body-worn camera video footage the next, calming tensions somewhat — a point Williams brought up. Williamson was arrested at last month’s meeting for exceeding her speaking time and refusing to stop, making it impossible to continue the meeting, police said. She spoke calmly and deliberately Wednesday evening. It has been 53 days since McNeil died while in the custody of the National City Police Department. McNeil, who had a history of bipolar disorder, went to the city’s police station on May 26 seeking help and ended up in a coma with severe brain damage. Police said McNeil was combative, agitated and paranoid, forcing them to put him into full-body restraints while transporting him to the county jail. Lane was one of the three people who was arrested Tuesday for disturbing the peace and disrupting a meeting. The crowd Wednesday became more vocal after the City Council vote against putting McNeil’s death the agenda for next meeting. Councilwoman Mona Rios introduced a motion to add McNeil to the agenda. The motion failed 2-2 with Vice Mayor Albert Mendivil and Councilman Jerry Cano voted against the motion. Mayor Ron Morrison was absent. National City police Chief Manuel Rodriguez was absent. “I think people here have some valid concerns about police brutality and the fact that we have not seen a video yet,” National City resident William Johnson said. The meeting had to be recessed again after it became too rowdy when the people in the audience started to speak over the councilmembers. The National City Police Department said it is still conducting an investigation into McNeil’s death and will review both police body camera video and a forthcoming toxicology report from the San Diego County Medical Examiner’s Office. McNeil’s autopsy report is currently sealed.